Wrap up in warmth and style in they Wonderful Winter Infinity Scarf!! 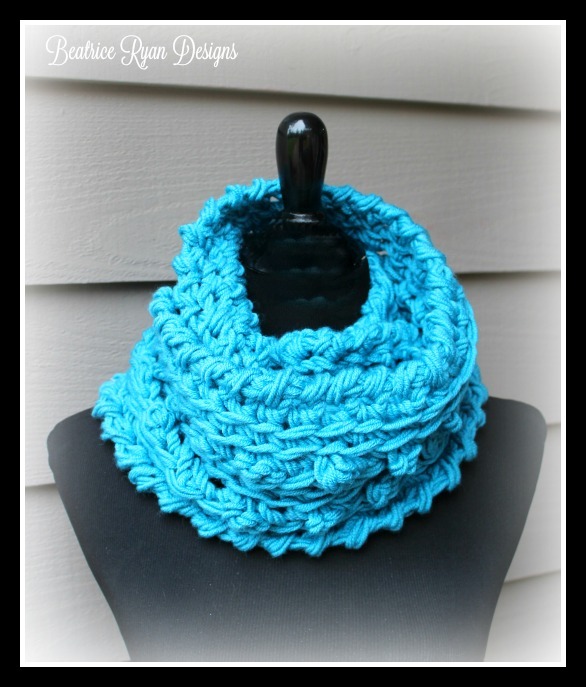 It is easy to make and works up so quickly you can make and wear it in the same day… Made with bulky yarn, this Free Pattern is a great stash buster!! If you love this pattern… Add it to your RAVELRY queue and favorites for easy access!! Click Here!! 250 Yards of Bulky (5) Yarn ~ Pictured above in Lion Brand Woolspun in Aquamarine (2 skeins). Insert hook into next st, yo, pull up loop, yo, pull through 1 loop, yo, pull through 1 loop, Yo, pull through both loops on hook. Push Special Bobble Stitch to the front of the work. Join to form a ring. Be very careful not to twist the chain. Rnd 9: Ch 1, Rev Sc in both loops around. Join with sl st. = 52 Rev sc. Finish off. Congratulations!! 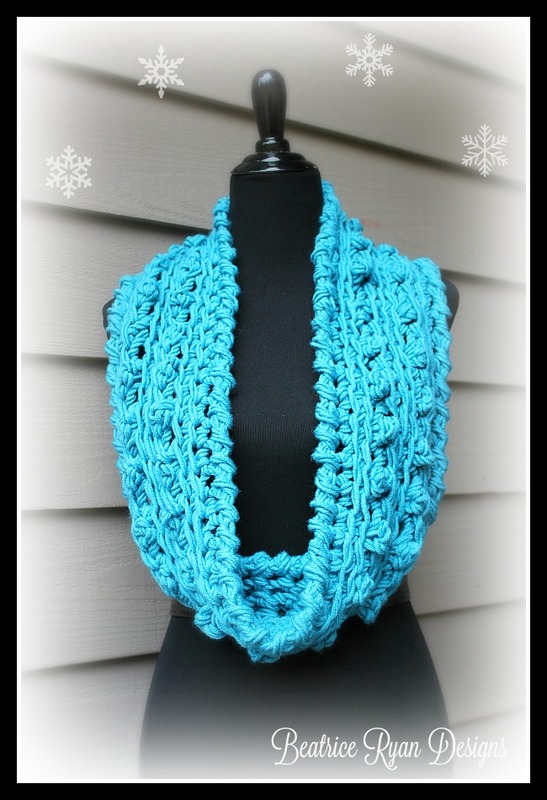 You now have a Wonderful Winter Infinity Scarf!! ©Copyright 2015 Elena Hunt/Beatrice Ryan Designs. All my, patterns and posts are my own work. Do not copy them in any way. If you want to share this information with someone, share the link to this post. If you want to share on your own blog website, then you may use the first photo in this post and link back to this post. You may not give away printed copies of this post. Thank you. This post may contain affiliate links/ads. If you purchase something from a link in this post, I may be compensated. Beautiful! Thanks for sharing. Pinned. Gorgeous all chunky and warm. Just tried this and love the pattern. However, I prefer a shorter cowl, so I frogged and will rework. Using 2 strands provides for endless possibilities!